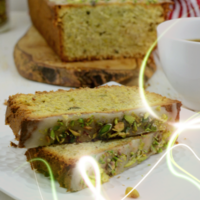 This recipe is a creamy pistachio pound cake with raw grainy pistachios garnished on top. I used Marshmallow, Meringue, and Marzipan to transform the Yellow Cake into pound cake. The TFA Pistachio brings that sweet creamy pistachio richness to the pound cake. The FA Pistachio, Vanilla Cupcake, and Acetyl Pyrazine combo is for the entire outside of the cake to include the browned portion from the baking process and the raw pistachio garnish. This was the recipe that I submitted for round 2 of the DIYorDIE world mixing competition. The creation of this recipe was a painstaking process that took approximately 3 months to create with over a dozen different versions. This recipe taught me the importance of note taking during the recipe development process. It is vital to the creation of a multi-layered recipe. It was a labor of love and I hope everyone who mixes it loves it as much as I do. It was outstanding. Enjoy it in a rda.